Editor's note: For more background about the studies on the early Americans and dating terminology, read the previous feature. Until recently, researchers believed our North American roots stretched back only about 11,200 radiocarbon years before present (YBP). These earliest settlers, from a culture now called Clovis, traveled from northeast Asia across the "Beringia landbridge," hunting large mammals with stone tools and colonizing the Americas via an "ice-free corridor" east of the Canadian Rocky Mountains (see story, this issue). However, in 1989, archaeologist Tom Dillehay at the University of Kentucky published a two-volume work entitled Monte Verde: A Late Pleistocene Settlement in Chile, which describe a human settlement dated to 12,500 YBP, approximately 1,300 years before Clovis. This site contained non-Clovis stone tools, a child's footprints and a community of dwellings constructed in part from animal skins. Archaeological sites like this and others found south of areas glaciated during the last ice age, and dated to between 12,500 and 11,500 YBP, imply that people had reached the southern tip of South America prior to the recession of the giant ice sheets, leading archaeologists to postulate alternative migration routes. Now geologists are also working on these alternative routes, exploring the region's glacial past to reconstruct a potential path for early peoples along the northwestern coast of North America. This digital topographic map of North America shows two possible early migration routes into North America. The terrain and bathymetry inset maps show the Queen Charlotte Islands region off the coast of British Columbia as it appears today, and as it likely appeared after the Last Glacial Maximum between 11,750 and 11,250 years ago. Lower eustatic sea level combined with a forebulge resulted in the formation of a coastal plain and thus a landbridge that probably facilitated the migration of plants, animals and potentially humans between mainland North America and the Queen Charlotte Islands and Vancouver Island. In the early 1960s, Calvin Heusser, Alex Kreiger, Kenneth Macgowan and Joseph Hester suggested the possibility of a Pacific coastal migration route for early peoples. In the mid-1970s Knut Fladmark, now at Simon Fraser University in Canada, did extensive analysis of the paleoenvironmental and archaeological data pertaining to a "coastal route," but his work met with little support. However, this all began to change when archaeologist Daryl Fedje from Parks Canada and geologist Heiner Josenhans from the Geological Survey of Canada discovered a forest of standing stumps deep under the marine waters off the Queen Charlotte Islands. Today, the possibility that the Americas' first settlers migrated via a coastal route has become an intriguing and increasingly popular, albeit contentious, theory. 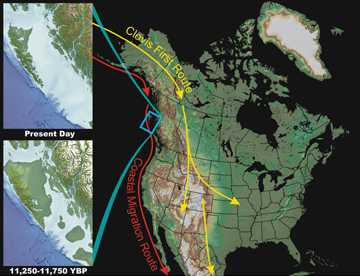 As with the ice-free corridor hypothesis, debate continues over whether archaeologists are presumptuous in assuming that the northwest coast of North America could support early migrating humans in their journey southward. Somewhat puzzling, considering the renewed interest in the coastal migration route, is the fact that few sites along the northwest coast of North America are older than 10,000 YBP. In 1997, archaeologist E. James Dixon, now at the University of Colorado at Boulder, and others reported in Geoarchaeology their discovery of a human pelvis and mandible in a cave on Prince of Wales Island, Alaska. The mandible dated to around 9,200 YBP, and a bone tool found in the same cave dated to 10,300 YBP (marine reservoir corrected to circa 9,800 YBP). Although exciting finds, these dates were more than 2,000 years shy of the evidence at Monte Verde. Yet, despite this lack of early archaeological evidence, the coastal migration route is fast becoming the prevailing theory as to how and when the first Americans arrived. Perhaps the coastal migration route is simply riding a wave of popularity; perhaps scientists lack sufficient creative vision of alternative ice-age human lifeways. But as enticing new evidence accumulates, including indications that brown and black bears, caribou and mountain goats survived along North America's northwest coast during and subsequent to the last ice age, the search intensifies to find substantive evidence of the region's ability to support early peoples and artifactual evidence of their presence. The coastal migration route follows continental plate boundaries, most of which are active and subject to major earthquakes. At the edge of the continental plates, the lithosphere is often thin and flexible and thus responds relatively rapidly to changes in eustatic sea level, sedimentation, erosion, glacial and water loading, and tectonic movement. As a result, along the northwest coast of North America, coastlines have continuously shifted, resulting in sea levels and coastlines significantly different than today's. But only by identifying their past locations can we determine where and when Americas' first peoples could have lived, and thus where early archaeological sites, if they exist, may remain. In January 2000, the first author Hetherington, then a graduate student, began a quest for the lost land purported to exist by proponents of the coastal migration theory. Building on research done by geologists and archaeologists along the northwest coast of Canada, she began to unravel the puzzle of why archaeologists hadn't yet found any evidence of people living along the coast prior to 10,300 years ago. After collecting and analyzing thousands of mollusk shells and combining results with geological evidence, interesting insights emerged. During the last ice age, early groups traveling along the northwest coast of North America would have seen coastal plains stretching over 100 kilometers as far as the eye could see, where now rough seas preside. They could have lived adjacent to productive estuaries and shellfish beaches now buried under moss and shrubs deep in the coastal rainforest. Such drastic geographic changes were the result of a drop in eustatic sea level of more than 120 meters, initiated when large amounts of water from the oceans were trapped as ice in expanding glaciers and continental ice sheets situated throughout Russia, Europe and the Andes in South America, and which extended across virtually all of Canada and southward beyond the Great Lakes into the United States. Large continental and alpine glaciers advanced and retreated across North America's north Pacific continental shelf. As ice advanced and retreated across the region, coastlines shifted in response both to ice movement and to eustatic sea-level change. The degree and direction of local sea-level change and coastline movement were dependent on where coastlines were situated relative to glacial ice. Heavy ice loads resulted in crustal depression and local relative sea-level rise on Canada's western mainland. When crustal depression exceeded eustatic sea-level lowering, coastlines rose above levels seen today. In areas peripheral to the ice, crustal uplift generated a "forebulge," similar to the upward bulging that occurs when laying on a water bed or the bulging area around a finger as it pushes down on a balloon. The glacial and sea-level history of the Queen Charlotte Island region, just off the northwest coast of Canada and just south of where James Dixon found human bones, is particularly complex and, from an archaeological perspective, particularly fascinating. The relatively low Queen Charlotte Mountain glaciers developed more slowly and later than on the mainland. Ice formed small caps, 500 meters thick, which flowed from the mountains. The limited size and extent of the Queen Charlotte Mountain source areas and the proximity of the deep water (of the open Pacific Ocean, Dixon Entrance and Queen Charlotte Sound) limited expansion of Queen Charlotte ice. Consequently much of the area became part of a peripheral forebulge. Ice-free areas (or refugia) may have developed on the islands and on the coastal lowlands of Graham Island, the northernmost island, where glaciation was limited and of short duration. Although researchers had previously gathered detailed local sea-level observations at a few locations in the area, vastly different sea-level histories for sites less than 50 kilometers apart made well-constrained regional reconstruction elusive. However, by radiocarbon dating intertidal marine shells obtained from beach deposits and combining that data with seismic surveys, geologic evidence and georeferenced computer modeling, we have been able to reconstruct the regional sea-level history subsequent to the last glacial maximum. Despite rising eustatic sea level, deflation of ice to the north and east promoted sufficient isostatic uplift to close the 100- to 150-kilometer-wide Hecate Strait by 11,250 YBP. Hecate Strait became Hecate Sea, a narrow, elongate, shallow-water embayment that opened southward into Queen Charlotte Sound. Two coastal plains extending up to 150 kilometers in width emerged from the sea, creating a land bridge between the islands and the mainland. These plains separated Hecate Sea from the open marine waters of Dixon Entrance to the north, significantly reducing marine circulation and contributing to a lowering of both salinity and temperature. Coastlines shifted more than 100 kilometers within the span of a few human lifetimes, causing us to reflect on the impact upon early peoples. During the last glacial maximum (about 15,000 YBP in the Queen Charlotte Islands) and for about 2,500 years afterward, glacial ice extended out from the Canadian mainland into Dixon Entrance, blocking navigation along northern Queen Charlotte Islands and between the islands and the mainland. This change required any migrating peoples to skirt the western side of the islands or to travel over ice when moving southward or northward. For about 1,000 years, the emergent land bridge would have required early people again to travel along the west coast of the Queen Charlotte Islands or overland. By 11,750 YBP, a warming climate supported the appearance of pine forests. Lakes were numerous, and many intertidal shellfish species colonized regions where similar species are common today. The uplifted coastal plains could have acted as migrating glacial refugia for early floral, faunal and potential human populations. Their existence may help explain how large mammals, such as the 41,000-yearold black bear (found by Tim Heaton of the University of South Dakota) on Prince of Wales Island, Alaska, north of the Queen Charlotte Islands, may have survived through the glacial period. The uplifted coastal plains could also have provided subsistence resources for mammals like the 12,000-year-old mountain goat found in caves on northern Vancouver Island. Before the last glacial maximum, Vancouver Island supported large mammals, including mammoths, mastodon, helmeted musk-oxen and bison. A mammoth humerus from southern Vancouver Island has been dated to 17,000 YBP, while three tusks from Chilliwack in the lower Fraser valley have been dated to 22,000 YBP. Parkland terrestrial fauna found by Brent Ward from Simon Fraser University and colleagues in Port Eliza Cave, Vancouver Island, date to between 18,000 and 16,000 YBP; they document the presence of toads, several bird species, Townsend's vole, heather vole, marmot, a very large marten and a mountain goat. Early postglacial remains from caves on the island indicate that mountain goats were again present, and finds from southern Vancouver Island document large bison, including one dated to 11,750 YBP. Neither species remains on the island today; Richard Hebda of the Royal British Columbia Museum in Canada suggests that Younger Dryas habitat change (from a cooling) from open parkland to coniferous forest may explain the latest Pleistocene disappearance of the bison. Some species may have survived in refugia on the island or the adjacent exposed platform through the last glacial maximum. If they did not, then dispersal of species such as bison suggests the presence of pathways on ephemeral outwash plains during early ice retreat. Perhaps such outwash plains were widespread and could have assisted in providing a corridor for human dispersal as well. Early coastal human migrants potentially obtained much of their food from the sea. Sea mammals were probably available in the open ocean throughout the glacial period; however, when glaciers were melting, shellfish occupation of the inshore marine environment would have been affected by low salinity and high turbidity. Based on the assumption that modern species provide a proxy for habitat characteristics of late- Pleistocene and early-Holocene species, Hetherington worked closely with malacologist (zoologist who studies mollusks) Robert G.B. Reid at the University of Victoria in Canada. They analyzed thousands of mollusk shells taken from submarine sediment cores (collected over the past 15 years by co-author Barrie and colleagues at the Geological Survey of Canada) and raised beaches throughout the region for clues about the ancient temperature, salinity, sedimentation rate, substrate and sea level. She also searched for edible mollusks - those shellfish having sufficient size to be worth the effort of collecting, and which researchers believe early peoples used. Their research showed that by 13,200 YBP, the edible shellfish Macoma nasuta overcame the high sediment barrier and invaded the muddy sands of a mudflat that is now Hecate Strait, east of the Queen Charlotte Islands. Shortly thereafter, rapid colonization by many species of edible shellfish suggests open ocean conditions were present and that food resources were readily available. Late-Pleistocene to early- Holocene edible shellfish biomass compares favorably with levels commercially harvested on modern beaches, with the exception of a decline between 10,900 and 10,100 YBP, coincident with the appearance of cold-water shellfish. The disappearance of most temperate bivalve shellfish species between about 11,000 and 10,000 YBP indicates the onset of a brief cold interval consistent in timing with the Younger Dryas cooling event. Seasurface temperatures reached less than 9 degrees Celsius. Some cold-hardy species persisted in the southern part of the region; however, reduced shellfish biomass during the Younger Dryas cool interval may have required early peoples to travel greater distances to collect coastal resources, or increase their reliance on land-based resources, or both. Temperate sea-surface conditions reappeared throughout the region by about 10,000 YBP. Warming temperatures contributed to rising eustatic sea levels, which inundated low-lying areas and transgressed the land bridge, severing the connection between the Queen Charlotte Islands and the Canadian mainland. Although researchers have cored and dated numerous resource-rich coastal zones in the Queen Charlotte Islands region that would have made excellent early habitation sites, many sites are now drowned and difficult to access. Nevertheless, definitive evidence of early coastal migrants may not be long in coming. In December 2003, some of the co-authors and others published an article in Canadian Journal of Earth Sciences that reveals hundreds of kilometers of reconstructed paleocoastlines that coincide with present-day exposed land. It is along these landscapes that possible early archaeological sites may be located. Paleocoastlines of particular interest, and which offer the greatest opportunity for long-term colonization and archaeological site accessibility, lie along the west coast of the Queen Charlotte Islands and westernmost points along the Canadian mainland, where the effects of glacial ice were reduced. Supporting this interpretation are recent multibeam swath and geological survey data from the southwestern shelf of the islands, which show a lack of ice-contact deposits, implying that glaciation did not occur along this coast. These findings provide encouragement that with perseverance, we will succeed in our quest for the lost land and for uncovering new scientific evidence of early peoples. Hetherington is a postdoctoral research associate at the School of Earth and Ocean Sciences at the University of Victoria in British Columbia. Email: reneehet@ocean.seos.uvic.ca. Barrie is a research scientist and head of the marine program for the Pacific Division of the Geological Survey of Canada, Natural Resources Canada and adjunct professor at the School of Earth and Ocean Sciences at the University of Victoria. MacLeod is a geographic information systems specialist at the Geological Survey of Canada, Pacific Division, Natural Resources Canada. Wilson is an instructor in both the department of geology and the department of anthropology at Douglas College, New Westminster, British Columbia. He is also adjunct professor of archaeology at Simon Fraser University. Funding for this research has been generously provided by the Geological Survey of Canada, the University of Victoria, Natural Sciences and Engineering Research Council of Canada (NSERC), Parks Canada, and the Ord and Linda Anderson Interdisciplinary Scholarship fund. The paper is a result of contributions made at Special Session 1 "Early humans and the evolving northeastern Pacific Margin" at the Geological Association of Canada (GAC), Mineralogical Association of Canada, and Society of Economic Geologists Joint Annual Meeting, held in Vancouver in May 2003, and sponsored by GAC Marine Geosciences Division and the International Geological Correlation Project No. 464. Dalton, R. 2003. The coast road. Nature, 6 March 2003, 422:10-12. Dillehay, T. D. 1984. A Late Ice-Age Settlement in Southern Chile. Scientific American 251, 106-117. Dixon, E. J. 1999. Bones, Boats and Bison: Archeology and the First Colonization of Western North America. University of New Mexico Press. Heaton, T.H. 1996. An ice age refugium for large mammals in the Alexander Archipelago, Southeastern Alaska. Quaternary Research 46, 186-192. Hetherington, R., Barrie, J. Vaughn, Reid, Robert, G.B., MacLeod, Roger, and Smith, Dan J. 2003. Paleogeography, glacially-induced crustal displacement, and Late Quaternary coastlines on the continental shelf of British Columbia, Canada. Quaternary Science Reviews, in press. Koppel, Tom 2003. Lost World: Rewriting Prehistory  How New Science is Tracing America's Ice Age Mariners. Atria Books, New York, NY. Ward, B.C., M.C. Wilson, D.W. Nagorsen, D.E. Nelson, J.C. Driver and R.J. Wigen. 2003. Port Eliza Cave: North American west coast interstadial environment and implications for human migrations. Quaternary Science Reviews, 22(4):1383-1388.